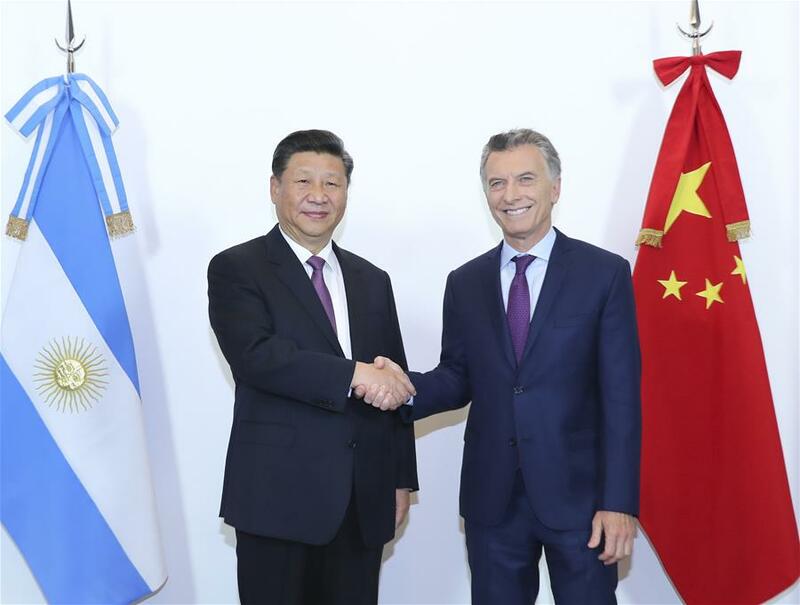 BUENOS AIRES, Dec. 2 (Xinhua) -- Chinese President Xi Jinping met with his Argentine counterpart Mauricio Macri here Sunday, and the two leaders agreed to jointly open up a new era of the comprehensive strategic partnership between their countries. Xi arrived here Thursday to attend the 13th Group of 20 (G20) summit and pay a state visit to the South American country. Xi said that he and Macri, meeting five times in less than three years, created a record in the history of bilateral ties, and that China-Argentina relations are witnessing unprecedented breadth and depth. Under the current complicated and rapidly-changing international circumstances, the two countries should chart the course of their relations with a broader vision, and work together to open up a new era of their comprehensive strategic partnership and make new contributions to peace, stability and prosperity in both countries and the world at large, he added. The two sides should support each other on issues concerning their core interests and on their independent choices of development paths, said Xi. China has taken concrete actions this year to support Argentina maintaining financial stability and has faith in Argentina's growth prospects, he added. He suggested that the two sides strengthen communication and cooperation within the framework of the Belt and Road Initiative and synergize their development plans. The two sides should also strengthen cooperation in such areas as infrastructure, agriculture, energy and finance and enhance people-to-people exchanges, Xi said. Both China and Argentina are major developing countries and emerging-market economies, and they should work jointly to support multilateralism and an open, inclusive global economy, he added. China, he said, is ready to work with Argentina to strengthen coordination within multilateral frameworks, deepen South-South cooperation, enable more developing countries to enjoy the benefits of economic globalization, and build a community with a shared future for mankind. Despite the current challenges facing Latin America, China is full of confidence in the growth prospects of the region and will work with partners in the region, including Argentina, to foster a China-Latin America relationship for the new era featuring equality, mutual benefit, innovation, openness and tangible benefits for the people, said Xi. Xi also congratulated Macri on the successful G20 summit, saying that the event was of great significance as it sent a strong signal on upholding multilateralism. The consensus reached at the convention is conducive to efforts in safeguarding the multilateral trading system and building an open global economy, and also helps inject confidence and vitality into the global market, said Xi. Macri warmly welcomed Xi for his visit to Argentina and thanked China for its long-term assistance and support to his country. He congratulated China, upon the 40th anniversary of its reform and opening-up, on its enormous achievements in social and economic development, poverty alleviation and other fields. Calling China a major engine driving the world economy, Macri said China's development and the realization of the Chinese Dream bear major significance to the development of Argentina and Latin America, and carry profound meaning to world peace, stability and prosperity. Argentina is firmly committed to deepening its comprehensive strategic partnership with China and strengthening cooperation within the Belt and Road framework, Macri said. In recent years, Argentina and China have enhanced mutual trust, with frequent exchanges in various fields, Macri said, stressing that bilateral cooperation has entered a new stage of mutual benefits and win-win results. Recalling Argentina's successful participation in the first China International Import Expo in Shanghai, the president said his country looks forward to further exploring the Chinese market. Argentina, he said, hopes to take the signing of a joint action plan for the next five years as an opportunity to expand cooperation in such fields as agriculture, finance, aviation and infrastructure construction, and promote exchanges in cultural and people-to-people fields such as tourism and sports. Argentina also welcomes Chinese companies to expand investment in the country, he added. Macri said he appreciates Xi's support for the just concluded G20 summit, adding that it is critical to the success of the summit. Argentina is willing to carry out closer coordination and cooperation with China on multilateral affairs, he said. The two leaders witnessed the signing of a joint action plan as well as multiple bilateral cooperation documents. The two sides also issued a joint declaration, in which they reviewed the development of bilateral relations and set out priorities for future cooperation.